Over the past couple of weeks, during classes, I have been thinking and developing a spread. This spread is designed to allow you to look into the personality of someone, and the various parts that make it up. This spread is divided into two dichotomies (much like the Tarot itself). The first dichotomy is that of the public and conscious aspects of your personality – the parts of you that others see and that you are aware of, that you allow to escape and be seen by the outside world – and the unconscious and hidden aspects of your personality – those things about yourself that you hide or don’t know yourself. This dichotomy is represented by the division between upper and lower cards; the upper three cards are all aspects of your public and conscious personality, and the lower three are all aspects of your private and unconscious personality. The second dichotomy looks at what I think are two important aspects of your personality, as embodied by the two questions the Vorlons and the Shadows ask in Babylon 5 – “Who are you?” and “What do you want?” As such, the left three cards all deal with identity, and how you are perceived by others, yourself, as well as how your past has influenced this identity. The right three cards represent your desire and your fears (for what is a fear but the desire that somethingwon’t happen?) – what you say you want, what you really want, and what you hope will happen in the future; your goals. The center cards are just the defining aspect of your personality, and like many Tarot spreads, are the most important aspects of your character and personality. The central cards also serve as the center of a Celtic Cross-based design; with the topmost and bottom-most cards representing what they do in the Celtic Cross, the left and right cards representing past and future like in the Celtic Cross spread, and the central cards also serving the same purpose. The ten cards in this spread serve to help one look into what forms the personality of a particular person – their thoughts and concerns, their hopes and fears, their own and others’ sense of their identity, and qualities that describe them. It looks at the goals of the person, and the influences that the past has had on them. The layout of the spread is a circle, signifying the idea of completion, and also resembles a wheel, representing the idea that one’s personality is always changing and moving forward (as such, it is important to remember that this spread only helps on understand one’s personality at the present moment; personalities can and do change). The circular form also resembles a face, with each section of the face revealing a different aspect of their personality. 1. Central Characteristic: This card represents the most important part of someone’s personality; it is the card that best describes and sums up the the personality of the entire person. It is both the primary factor and the summary of the rest of the spread. 2. Influencing Characterstic: This card is the second most important aspect of someone’s personality, and influences, mitigates, or complements the Central Characteristic; in many ways it also the secondary characteristic of a person, and provides a second dimension to one’s personality, adding depth to it. 3. Influence of Past: This card sums up the influences that past events have had on one’s personality; memory is an important part of our personality, our desires, and our own identity. This card represents and shows the influence that this memory has had on a personality. 4. Goals of the Future: This card represents what one are striving to accomplish; another aspect of one’s personality is their drive, and what makes them motivated: that motivation and drive is represented by this card, which shows the thing that the person is striving to achieve, and their most important desire for the future. 5. Unconscious Thoughts and Motives: This card represents the unconscious thoughts and concerns of a person, and also represents this person’s motives. 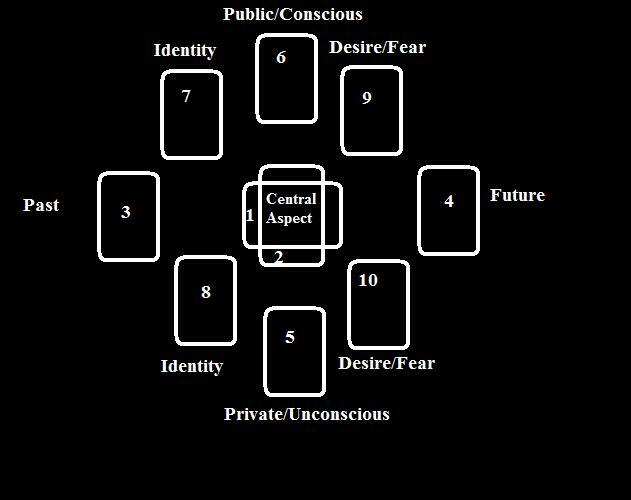 It answers the questions of “why do they do this?” as well as those of “what are they really thinking?” This is their unconscious drive (rather than the conscious drive of Card 4), and represents the deepest aspects of their personality, hidden from themselves. This card also serves as the synthesis of cards 8 and 10. 6. Conscious Thoughts and Concerns: This card represents the person’s conscious thought. It helps one examine what the most important things are to this person, and represents their most pressing concerns, and what is most important to them at this time. This card also serves as the synthesis of cards 7 and 9. 7. Public Face: This card is the public aspect of one’s identity; this is how others perceive this person, and how their environment (including other people) affects them and notices them. This card is similar to Card 8 (second from the bottom of the Staff) on the Celtic Cross. This card represents how they want others to see them as well. 8. Private Face: This card represents the concept of self-identity and self-image, and shows how a person really thinks of themselves. This might line up with one’s public face, but often is at least slightly different. This card is similar to Card 7 (bottom of the Staff) of the Celtic Cross spread. This card shows how this person really feels about himself, and what they think their own identity is. 9. Public Desire: This card represents what one says they want; it is the stated hopes and fears of a person. This is what the person wants others to think they want and what they want others to think they are afraid of; this card represents those desires made public. 10. Private Desire: This card represents one’s true hopes and fears; their heart’s desire or their deepest, secret fear. These are the desires that people keep repressed and hidden – sometimes even from themselves – for various reasons. These are the inner passions and repressed terrors that often motivate people’s actions unconsciously.